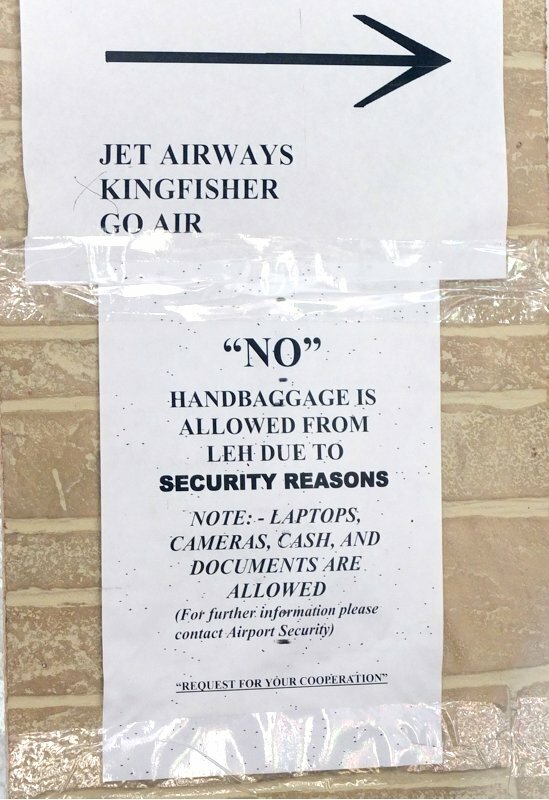 Flying Out Of Leh | high road to..
Standard baggage check ( where my storm kitchen is immediately picked out on the x-ray screen , and the uncapped tank saves me from ripping up the pack ) , then walking thru the metal detector … and a long pat down . Not a single smile as my parting gifts wrapped in khataks comes up . The next Ladakhi official tells me unprompted that this was a newbie from Kargil , hinting at him being half outsider , and that he clocked the process at twelve minutes. My fault , mostly : a good pair of travelling pants stuffed to avoid overweight charge for my main pack. The requested cooperation is symbolic from other passengers as well : lot of people like goes thru with not only laptops but with the laptop bag , which acts as the male handbag . Then a repeat baggage check , and the final identifying of my pack out on the tarmac before it gets loaded on the airplane. Two AA batteries turn up at the last screening , gets whisked away … and discretly returned to me before the the plane takes off.